The approach of the campaign is new, too, focused on the workers who help bring Red Lobster’s fare to its customers. 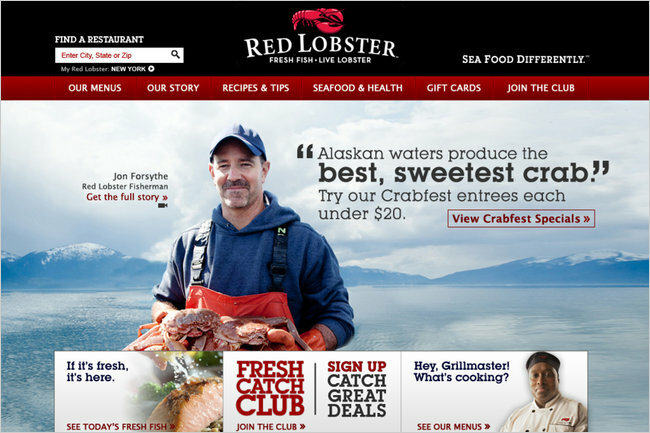 The initial two commercials — as well as content on substantially redesigned versions of the Red Lobster Web site, redlobster.com, and Facebook fan page,facebook.com/RedLobster — feature Jon Forsythe, who fishes for crabs in Alaska, and Charles Himple, who presides over the oak-wood grill at the Red Lobster restaurant in the Bronx. Red Lobster to Showcase Its Real People in New Campaign – NYTimes.com. Next PostHalibut Commission Meeting Webcast. The fried sea food is not only tasty, but is affordable too. That’s the reason behind its popularity with every other race.